Though frost still covers the ground in many places, in every part of the country, thoughts are turning to warmer days and beautiful blossoms. Our gardens might not be ready to display all the greenery of the season, but there's no reason that our homes shouldn't be alive with it. 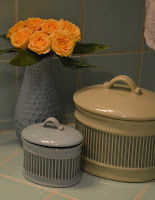 A quick trip to my go-to flower supply (Trader Joe's) equipped me with all of the pastels and brights I needed to make my home an exposition of Spring: hydrangea, miniature roses, garden roses, eucalyptus, stock, Peruvian lilies and assorted greenery. In total, I purchased 5 different bouquets for $24, and managed to make 3 beautiful arrangements. Martha Stewart: eat your heart out. Arrangement One: The Big Mama-Daddy. 1.Vase Logic: Leveling the Field(s). When selecting a vessel for your arrangement, remember to vary the levels, and add height when you can. As this arrangement is going to be a focal point in a big room, I want to make sure it doesn't get lost. A large, shapely footed hurricane (The Madeline Hurricane from Southern Living at Home) is the perfect solution. 2. Picking the Posies: Just as it's important for the vase size to match the location, it's equally important for the flowers to fit the vessel. Because this is a large piece, I need to make sure I use large flowers that can hold their own. 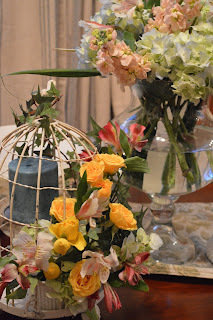 I also plan to group the finished product with another arrangement, so I don't want these flowers to overpower anything else I choose to add to the composition. Baby blue hydrangea, petal pink stock and ivory and pink Peruvian lilies become my building blocks. TIP: You may notice that your hydrangea is wilting quickly upon adding to an arrangement. To prevent this, heat a cup of water til almost boiling. 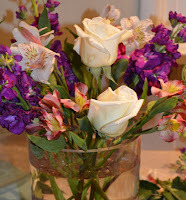 Place the cut stem of the flower into the water for thirty seconds. 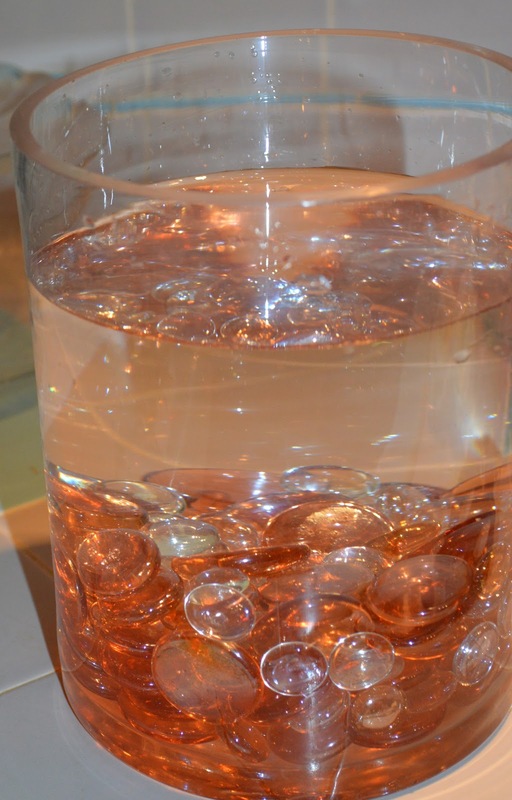 Remove and place in room temperature water. 3. Fashioning the Flora: Always start with the biggest blooms first. In this case, it's hydrangea. I place three large blooms in a tripod formation. Using those as a guide, I then insert the pale pink stock (cut slightly longer than the hydrangea) at even intervals along the side, working my way into the center. Peruvian lilies are tucked IN the hydrangea web to interject pops of white and pink within the blue. To add some interest to the composition, I selected some long, spiky fronds from my front yard, folded them along the outer edge of the vase, and inserted three sticking up out of the arrangement itself. 1. Vase Logic: This piece is going to brighten my living room. When the coffee table is not in use, the arrangement will sit atop a tray with some books and candles. When we're watching tv or have company over, I will need to move it to a side table or the mantle. All this means that it needs mass, but not so much that it's cumbersome or likely to tip over. For this, I need the workhorse of the vase family: the cylinder. 2. Picking the Posies: Because of the simplicity of the vase, the flowers can be more visually complex and varied. For this I select white garden roses, purple and pink stock, purple and pink lilies, and eucalyptus. 3. Fashioning the Flora: With any floral design, it's important to be aware of how many angles the finished product will be visible from. This piece will be on a table in the middle of the room most of the time, so it needs to be symmetrical. Rotating the vase every minute or two will ensure that I'm spacing the flowers evenly. 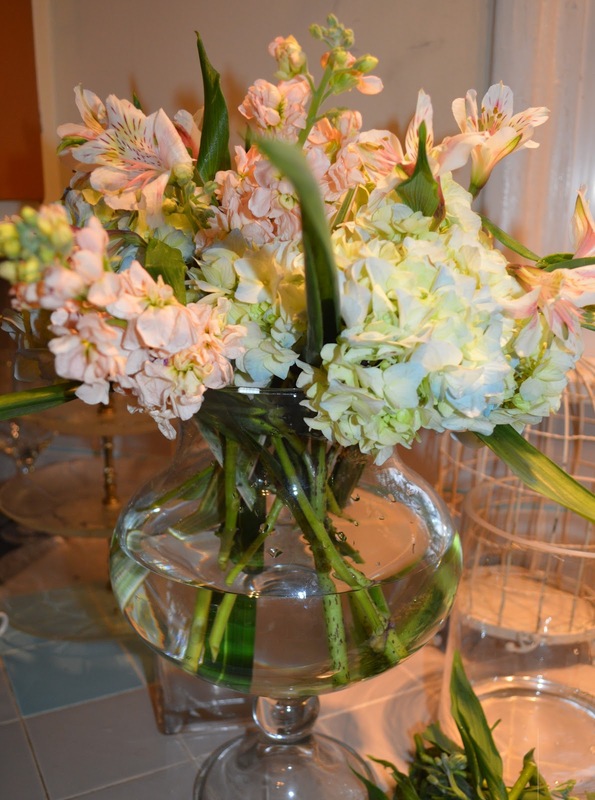 With a large open mouthed vase, it becomes increasingly difficult to make the flowers stay where you want them to. I've discussed using a tape grid before to keep flowers in place, but in this case the edges won't be covered and the grid will show. Florist foam, though useful, might look a wee-bit ridiculous in a glass vase. 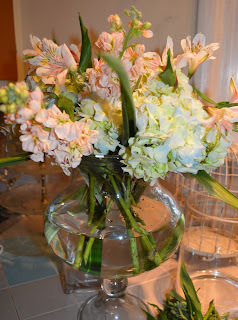 Glass floral gems will add moderate support as well as color and weight to the bottom. The roses are the largest flowers that I'm using, so I place them first. Again, I work from the outside in, in a spiral pattern that grows in height as I get to the center. Next comes the stock, and I alternate pink and purple as I turn the vase. (Adding the stock will also help your roses to stay where you want them). The Peruvian lilies (the most delicate flowers), and the eucalyptus and greenery are the last pieces to be added. These allow me to make the final positioning touches to the roses: the stars of the arrangement. 1. Vase Logic: A vase does not always need to be just that. When you really want to add some artistic flair, choose something that's completely unexpected: a teapot, a basket, a tiered serving platter. 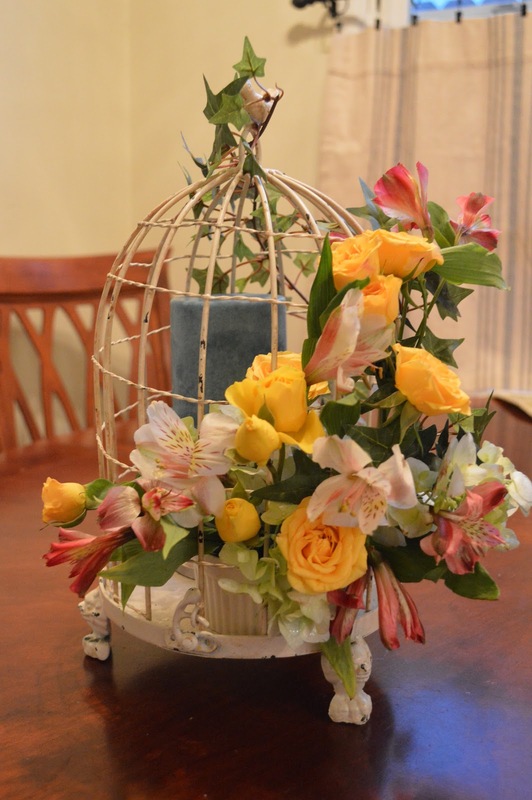 For this piece, I'm using a small decorative birdcage. 2. Picking the Posies: As the birdcage is quite small, I need to find flowers that won't overwhelm it. Bright yellow miniature roses, small bits of hydrangea (left overs from the first arrangement), one or two Peruvian lilies and ivy work perfectly. 3. Additional considerations: Using the cage as the main container means that several other things need to be in place. 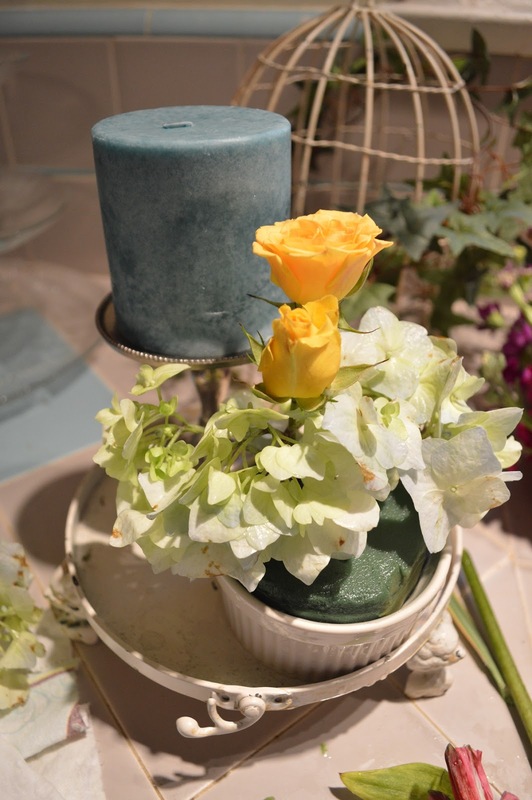 A sea colored candle on a silver stand gives height and color for the backdrop of the flowers. The flowers themselves, that will be both inside and outside of the cage, will need a source of water (and no matter how hard I try, the cage just refuses to fill!). For my purposes, a small ramekin is an excellent fit. The ivory color and ribbed edging blends into the cage quite well. 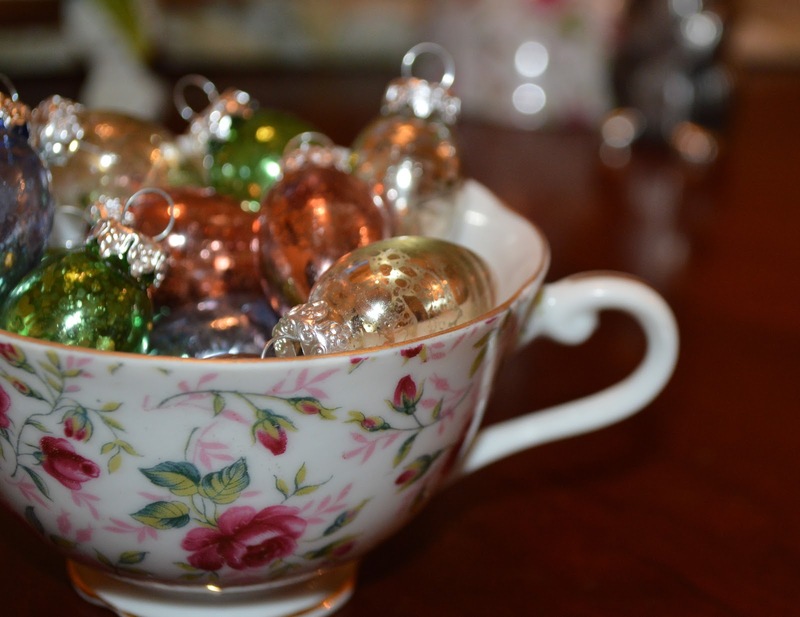 Were the cage slightly bigger, I might use a teacup and saucer - unexpected and colorful. 4. Fashioning the Flora: Though the ramekin by itself will hold water, it won't do much to hold the flowers in place. 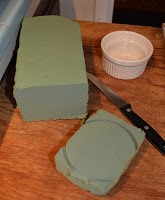 My first move is to cut a piece of wet florists foam to fit snugly into the bowl. Once it's ready, I can begin with the flowers. With the cage dome off, I begin by inserting some hydrangea pieces and greenery low in the ramekin. 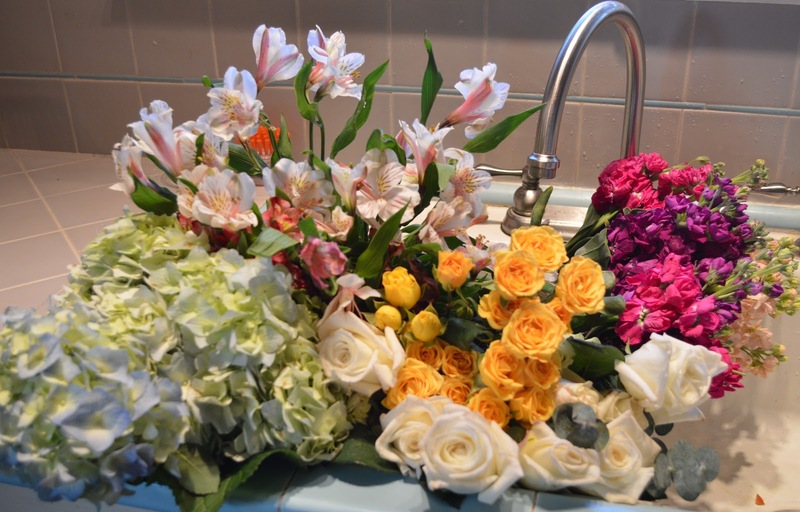 These cover the florists foam and begin by adding a color base to the arrangement. Next, I snip a few miniature roses from a bunch and create a progressive rise, with each rose more open as I move upward. A few additional green pieces in the foam and it's time to work with the cage itself. Using florist wire and floral tape, I secure several trails of ivy to the domed cage. The majority of them should be on the side opposite the candle, imitating the height and providing green groundwork for the bright yellow roses. Once completed, I attach the cage to the base and the real work begins. Moving slowly and carefully, I use tweezers to grasp clipped rose stems and insert them through the cage into the foam (leaving the blooms on the outside). I alternate every so often with small bits of greens or lilies. TIP: When working with wet foam, be careful not to insert a stem and then pull it out slightly or reposition. Wet foam does not recover itself and by poking a hole into it and then pulling back slightly, you can create an air pocket that water does not fill, and your flower will not get the moisture it needs. Once I'm completely finished, I place the cage next to the footed hurricane and scatter in some candles and pewter bunny salt and pepper shakers (Pottery Barn, c/o my mama).